For additional information about this book, visit the website www.transfat.com. Within the last century arteriosclerosis has gone from obscurity to a full-blown epidemic. Clearly, this is a direct result of societal changes. The need to eradicate this disease is plain, but how can we cure it when most medical professionals don’t know—or choose not to see—what causes it? Julian Kadish, MD PhD, has drawn a strong conclusion that is shocking in both its simplicity and the fact that so many refuse to take notice. While monitoring cholesterol and blood levels is important, the data points to a conclusion many professionals have not reached: the root cause of arteriosclerosis is consumption of hydrogenated oils. 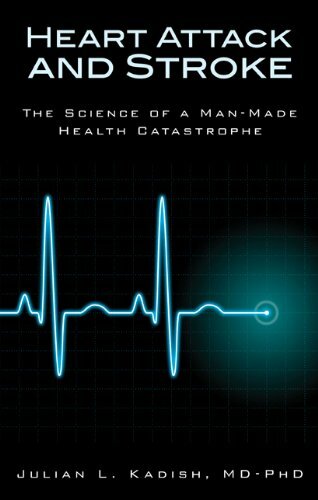 With "Heart Attack and Stroke: A Man-Made Medical Catastrophe," Kadish focuses on arteriosclerosis with a simple, logical interpretation that has the ring of truth—and an undeniable and simple prevention. A well-researched resource for physician and layperson alike, "Heart Attack and Stroke" will convince any reader willing to review the data with an open mind. Dr. Julian Kadish began his career in medicine in the combined MD-PhD program at New York University School of Medicine in 1969. He completed his preclinical training in 1976 and entered a clinical rotation at Boston City Hospital (now Boston Medical Center). Shortly thereafter he began practicing emergency medicine at a community hospital in Massachusetts where he still practices today. He simultaneously began a course of training in several research fellowships and research programs over the next several years in laboratories in Boston at Children's Hospital, Massachusetts General Hospital, Beth Israel Hospital, and Brigham and Women's Hospital. Dr. Kadish became board-certified in Emergency Medicine in 1989. The dual training in both the details of basic laboratory research as well as the broad clinical experience of emergency medicine gives Dr. Kadish a unique perspective of understanding how basic laboratory findings can be translated into clinical practice. Early in his research career, Dr. Kadish made a serendipitous laboratory finding about the behavior of endothelial cells, the cells that line all blood vessels in the body. Throughout his clinical and research career, he has continued to examine multiple research areas related these unusual cells, ultimately resulting in a groundbreaking book introducing a new concept of the detailed mechanism of arteriosclerotic vascular disease. He continues to pursue the clinical implications of that new concept in ongoing clinical research today.